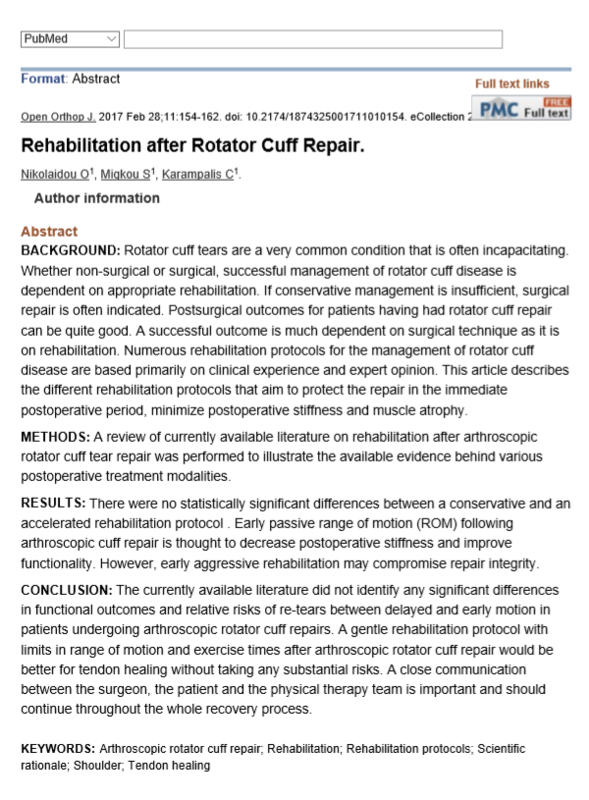 Following a rotator cuff (RTC) repair, patients are likely to seek/be referred to Physical Therapy to regain functional motion and strength of their shoulder. 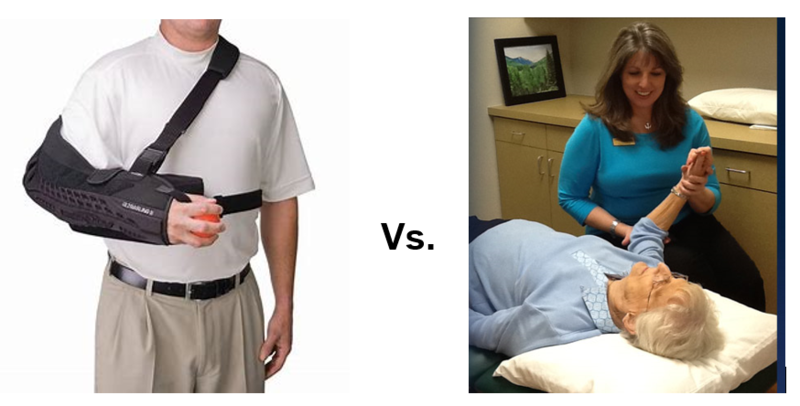 Surgeons typically have their own protocol they provide the Physical Therapist; however, the ongoing “HOT” topic up of debate is early motion vs. sling immobilization following a RTC repair. To elaborate, often after a rotator cuff repair, the affected shoulder will be immobilized for around 6 – 8 weeks in a sling; however, some protocols allow for early movement of the shoulder which may decrease early joint stiffness. Let’s see what the research has to say. A Randomized controlled trial by Bong Gun Lee in 2012. A meta- analysis of randomized control trial by Ke-Vin Chang in 2014. A systematic review by Bryan M. Saltzman in 2017. The similarities between these articles are that they acknowledge that beginning motion early may be beneficial; however, the authors further state to err on the side of caution due to risk of re-tear. In the 2017 study below, Nikolaidou et al. gathered results on studies done by Huang et al. along with 6 other authors supporting the post-operative “early motion” protocol. These more aggressive protocols have demonstrated superior results with overall range of motion and shoulder function compared to a more traditional/conservative protocol with follow ups extending to 1 year post-operatively. 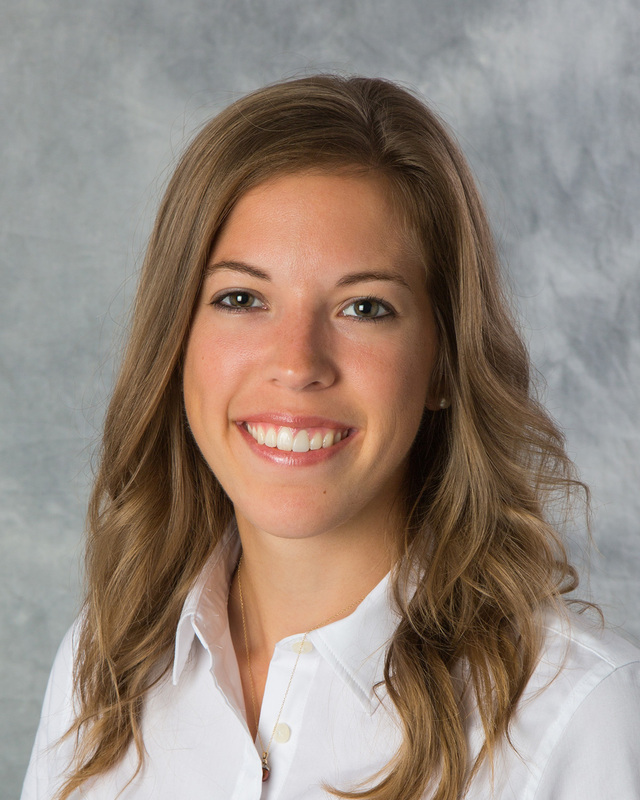 As healthcare providers, it is our job to help maintain great communication across the board with surgeons to ensure that our patients are provided the best of care in order to help them reach their greatest potential. While it may seem that early motion is the better and more obvious option post-operatively, it may Not be the best option depending on the individual and other risk factors including but not limited to: severity of the tear, health issues that may prolong tendon healing, and age. Contact us if you have questions or leave a comment below! Thanks!